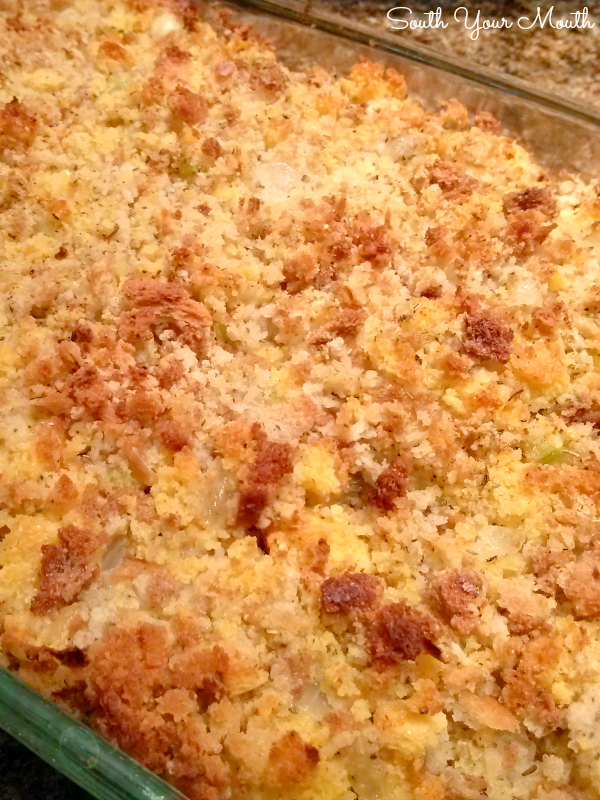 A recipe for Southern cornbread dressing made with cornbread and herb stuffing for the perfect Thanksgiving side dish that everyone will love. 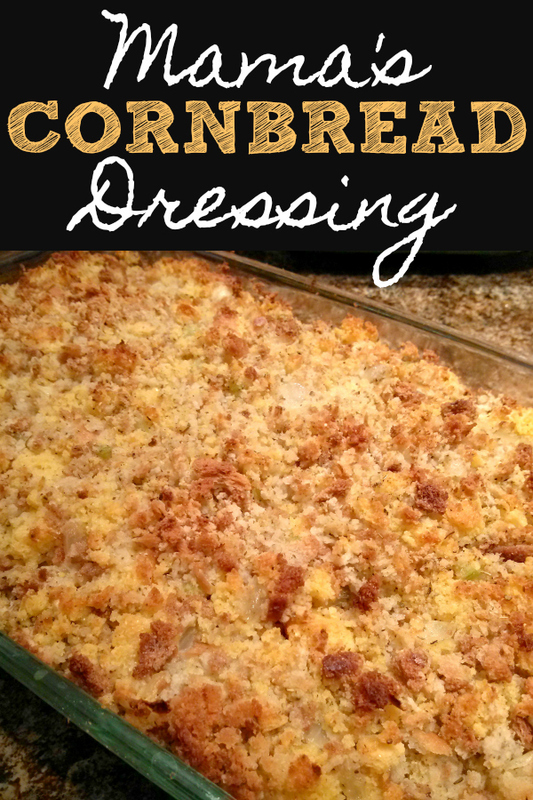 Down here we make our dressing with cornbread. Period. 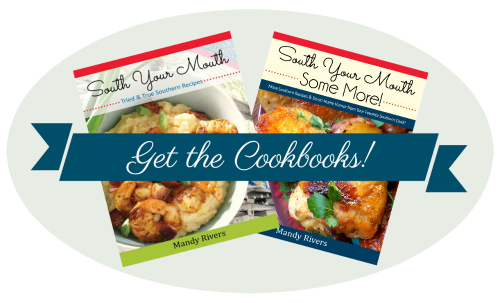 But since my mama’s not a native Southerner, she does things a tiny bit differently... and everyone LOVES it! She came up with a recipe that's a compromise between traditional cornbread dressing and traditional stuffing that everyone loves by adding traditional packaged stuffing mix to the cornbread. And it's amazing! 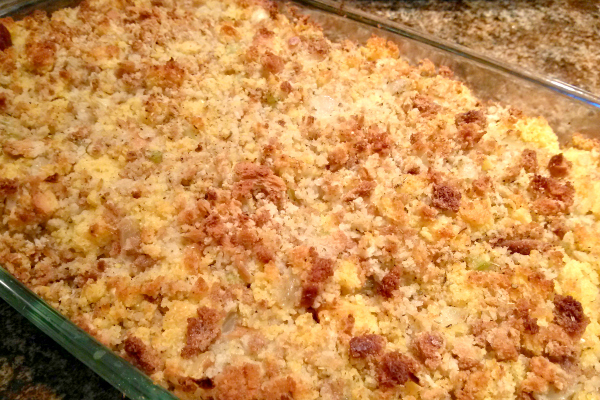 My deep-rooted southern family LOVES this dressing and I'm not even sure most of them realize there's regular bread stuffing in the mix! We always add chopped boiled eggs to our dressing (though I didn't when this picture was taken because I had a bunch of Canadians in the house and didn't want to scare them off). You can add boiled eggs, crumbled sage sausage, oysters, sautéed green peppers or just about anything your family likes. This is just a great base recipe to use to get you started! 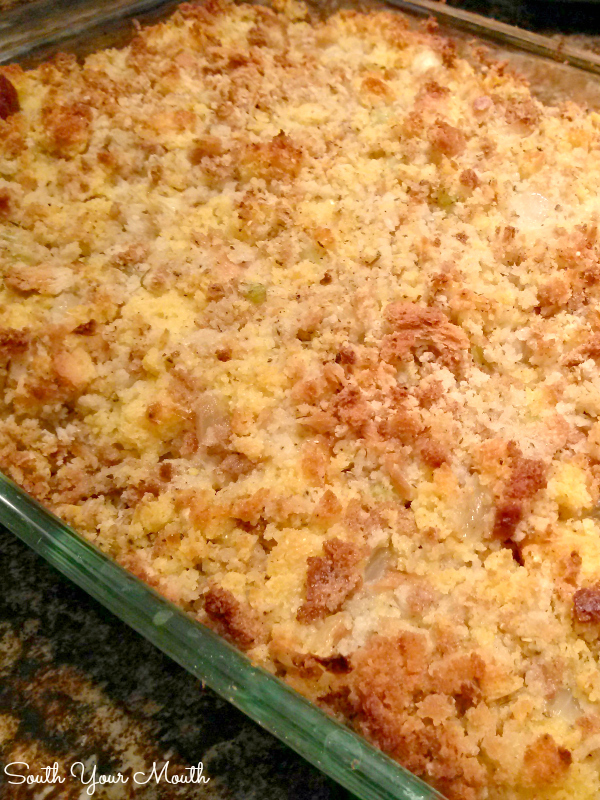 Crumble cornbread into pieces uniform in size with the herb stuffing. Add cornbread and stuffing to a large bowl; set aside. Melt butter in a large skillet over medium-high heat; add onions and celery and sauté 4-5 minutes to soften them up a bit. Add contents of skillet to cornbread mixture. Add salt, pepper, poultry seasoning, broth and cream of chicken soup to a mixing bowl then stir until thoroughly combined. Add broth mixture to cornbread mixture then gently toss until all ingredients are just combined. Taste for seasoning at this point and add more if you like. I start with a small amount of each and go from there – how flavorful your broth is has a lot to do with how much additional seasoning is needed. Do not over-mix the dressing or you'll end up with a dense loaf that requires a knife and spatula to serve. Blech. Spoon cornbread mixture into a buttered 13x9 casserole dish. Bake, uncovered, at 350 degrees for 30-40 minutes. I made this for our Gayheart Reunion this past weekend, but doubled the recipe, and had rave reviews, needless to say I brought home an empty pan. Love it!! Ramona, I don't know how I missed your comment but I'm glad I found it! You just made my day! Thank you for writing! Love how recipes can differ so little and be "ours".. Thanks for sharing!! My mother makes it this way with bell peppers. Divine. And every time I smell onions, celery, and bell pepper sauteing, I think of Thanksgiving. Thank you for sharing this recipe at Weekend Potluck. Pinning. Omgosh, just found you, you are freakin hilarious. I just Love reading your recipe posts they make me LOL your just cute as a button. Thanks for the laughs and awesome recipes. I make mine with sausage! While I love turkey, I've never been that crazy about dressing. It was just that dry stuff you put gravy on. (My grandmother made 2 kinds. I cant remember what they were but I didn't really like either). One year at a Thanksgiving pot luck at work, one of my friends made dressing and I loved it! A big reason was that it had pieces of turkey in it. It had eggs and onion and all those things. I never make it any other way now. Though I prescribe to the box kind cause I'm too lazy to go to the trouble to make it from scratch. One year my (then) husband made crawfish dressing-yummy! I make mine just like this but if you are pressed for time you can also use bag cornbread stuffing. Just add a little more broth. I'M from the south and my family loves dressing at thanksgiving.But the way i do mine, and the way i was taught by my mom.I boil turkey necks,turkey wings,turkey legs,couple stalks of celery,stick butter boil on med for two hrs then add chicken liver and girzzards cook another hr.then make one pan cornbread and one bag cornbread stuffing. mix the two. then chopped up the meat after cooled.i boil six eggs and chop them up.you dont half to use all the liver and girzzards just some for flavor,and if you do it this way after meat is done i take celery out and toss it. all you want is the meat and juice i know this sounds like a hard jod its not.just takes a little time but worth it.i chop a onion in cornbread,put the turkey meat in and eggs and then six raw eggs,as you can tell i make a big turkey pan of dressing,and it all gets eating lol.then i add my juice i cooked my meat in and i even use some of my turkey juice from my turkey that i baked. always butter ball on my table.I add salt,pepper,sage and poultry seasoning,mix all together add enough juice to make it creamy nobody likes dry dressing cover with ten foil and bake 45mins the last 15mins take foil off to brown on top. and the meat you chopped i use some of that in my givlet gravy to pour on dressing.just thought i would share mine. This is exactly how I make mine too. Taught by my mom who was raised in the south. Everyone loves this recipe!! There are people who throw away bacon grease??? I am aghast! How do they flavor things? That is how we fix ours too, except for the eggs. Dont find we need it. This is basically a Carrot cake.......just add 3 cups of shredded Carrot's................ummmmmmm.........good! Very similar to my Mother's (and Grandmother's) recipe. We've made this cornbread for many, many years. Still nothing better than a bowl of pinto beans, cornbread crumbled in them...and chopped onion, of course! How big of a pan of cornbread and can I use a package cornbread? Click the link to the Skillet Cornbread for the recipe (will give you an idea how much). You can use a box mix but don't use anything sweet like Jiffy mix. You cook like my Mimi! Yummo! We add Jimmy Dean sausage to the mix! Looks wonderful and on-target as long as you skip that nasty cafeteria seasoning sage! Can I assemble the day before and cook it after the turkey? So is this crumbly or more one with itself - like a corn casserole might be? I've never had corn casserole so I'm not sure! It's not a loaf like some dressings are so I guess you could call it crumbly. If you pinch it together, it will clump. If you want it more dense, just keep stirring to break is down more before you cook it. I hope that helps! My Mom makes a dressing like this, but she adds in some of the giblets from the stock she makes. Now this is dressing! Every recipe may be a little different, but this is dressing. I'm going to have to try the Cornbread recipe, for sure. I just haven't come across a Cornbread that isn't sweetened, and really want the UNSWEETENED kind, if I might have a recipe for it, or a name of a boxed cornbread, that I may use. Thanks. I have two different versions of your recipe. One calls for poultry seasoning and cream of chicken soup. The other one calls for sage but no poultry seasoning or cream of chicken soup. Which recipe is right? Love reading your blog! Thank you. Both are correct - one is my recipe, they other is Mama's (there are two on my site). I realized a while back that Mama puts cream of chicken in her recipe which I didn't include here originally so I added it to this recipe.